It can be difficult to tell how well a theme is optimized for SEO as some of the features are sometimes hidden. Highly optimized SEO is in the details and you can tell by how the code and features are described. A well-designed theme would have clean code that search engines love. They would be built with SEO best practices which would focus on headings, Google rich snippets for posts and reviews, Google authorship, semantic HTML5 markup, CSS3, be responsive, etc. Some themes even give you some extra tools to help you customize and improve your SEO even further. With these features in mind I found 15 themes that are SEO friendly and help make your content highly discoverable. A few of these are older themes but they’ve been updated and are great examples of clean code that’s SEO optimized. They’re in no particular order. Let’s take a look. Divi is a theme from here at Elegant Themes that has a modular drag and drop builder with dozens of modules so you can create any kind of layout you need. 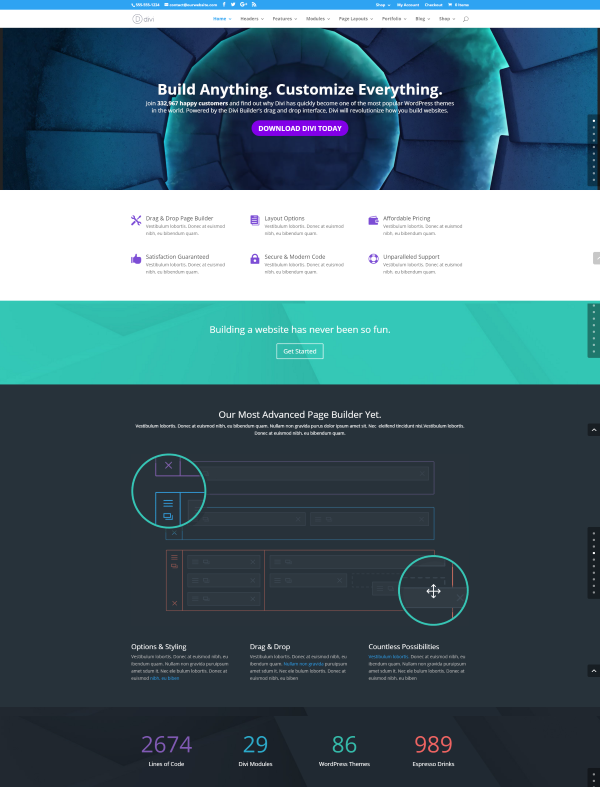 You can also use the many premade layouts and modify them any way you want. The theme options panel includes an SEO tab where you can set up custom SEO for your homepage, single post page, and index page. You can set up custom titles, description, keywords, canonical URL’s, custom fields, and lots more. You can enable or disable any field you want, giving you complete control over how the theme can handle your SEO. It’s a great choice for building any kind of website you can imagine. 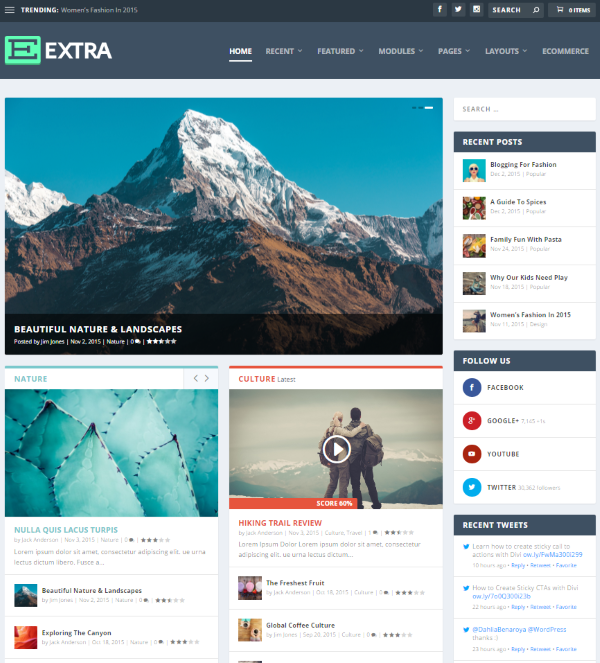 Extra is Elegant Themes’ magazine theme built on the Divi modular platform. It adds a category builder so you can create custom magazine layouts that focus on categories. It includes dozens of modules and premade layouts and you can modify them to create your own layouts to use and reuse. The ePanel includes custom SEO features for your homepage, single post page, and index page SEO. You can enable or disable each feature. SEO functions include title, meta description, keywords, canonical URL’s, and more. You can set up definable characters to separate names and choose the autogeneration method. 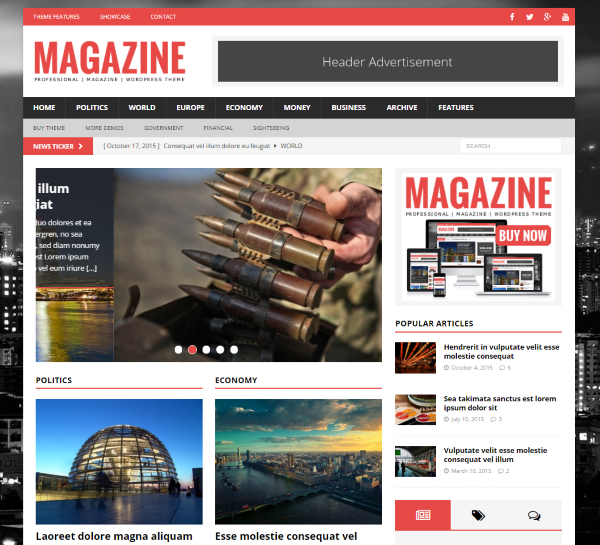 It’s a great choice for any kind of online magazine. 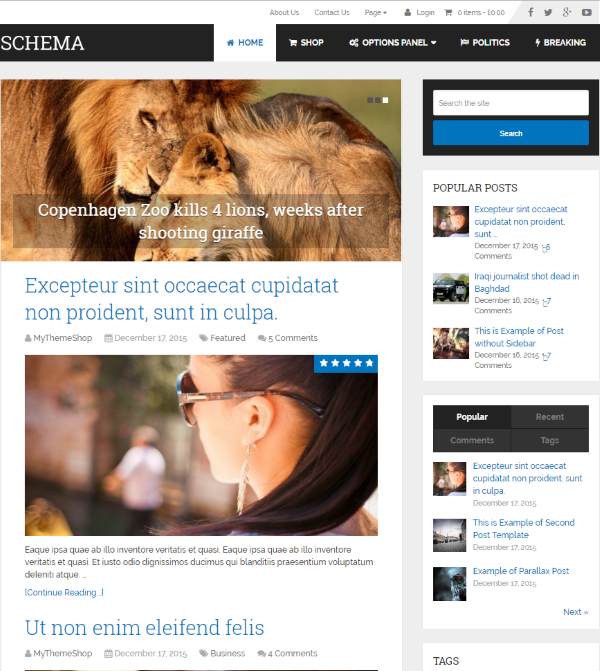 Schema is a fast loading theme that’s ultra SEO friendly. It includes a custom options panel, custom widgets and shortcodes, and a built in review system. It follows SEO best practices and has high quality code with a fast loading time. It identifies content, media pages, and rich snippets to search engines so they know how to identify your content which can rank your website higher in the search results. It’s a good choice for personal blogs and magazines. 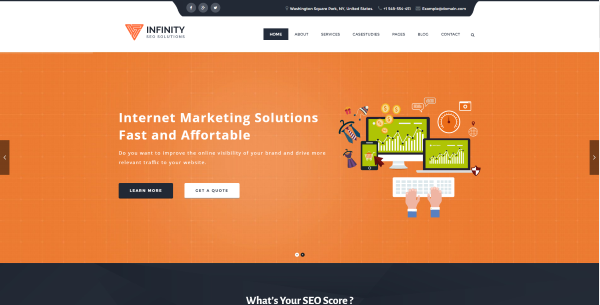 Infinity is a high performance theme designed specifically for speed and SEO optimization. It’s highly optimized and will improve your PageSpeed and YSlow scores and includes clean code. It has several page templates and you can design your own layouts using the included Visual Composer plugin. It includes lots of shortcodes and widgets and you can customize the look of the site using the live customizer. It’s an excellent choice for corporations. 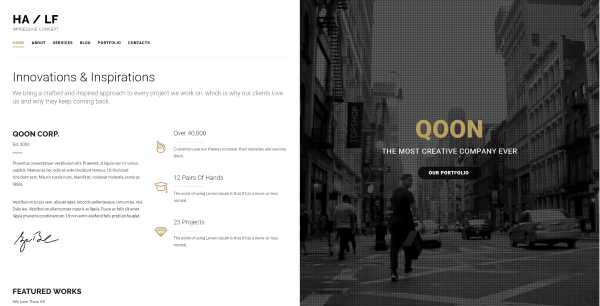 QOON is a creative theme with lots of features and layouts built in. It can build any kind of page you need using Visual Composer and has several built in templates to help you get started. It was coded with HTML5, CSS3, and jQuery to be fast and clean. You can create unlimited portfolio pages and each one can have its own settings and categories. It was built with SEO in mind with a focus on headings, Google rich snippets, etc. It has a strong focus on UX and is a great choice for portfolios and agencies. Gloria is a drag and drop magazine theme that was developed with the best clean SEO practices in mind. It comes with 6 demos that you can modify to help you get started. Choose between the many post formats and layouts or create your own. It also has 6 headers, parallax, mega menu, unlimited colors, timeline, news ticker, and a theme customization panel. The sliders and animations are smooth. This one is a great choice for magazines and personal blogs. Clementine is a simple and clean theme that was made with SEO in mind. It comes with lots of layouts, page templates, widgets, shortcodes, etc., to help you develop any type of website you want where simplicity is the goal without losing features. You can customize your site even further using the advance options panel. It’s a good choice for personal blogs, artists, and photographers. 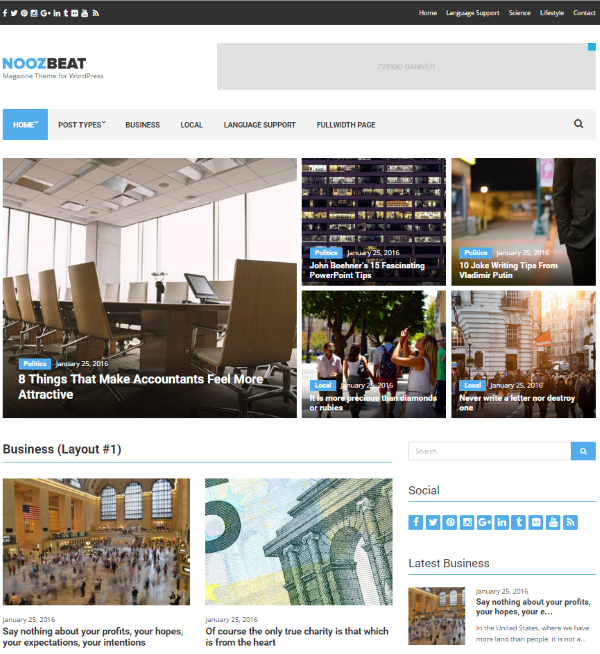 Noozbeat is a simple magazine with multiple homepage layouts that focus on SEO. It includes multiple homepage and category layouts so you can create the pages you want. There are three different post types including a ratings post type where you can write detailed ratings for reviews. 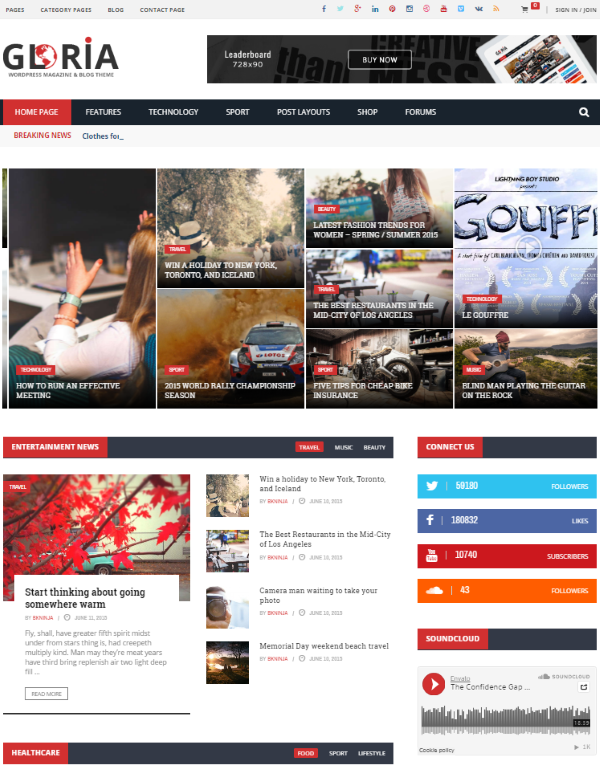 It’s a clean theme that loads fast and is ideal for any kind of magazine or blog. 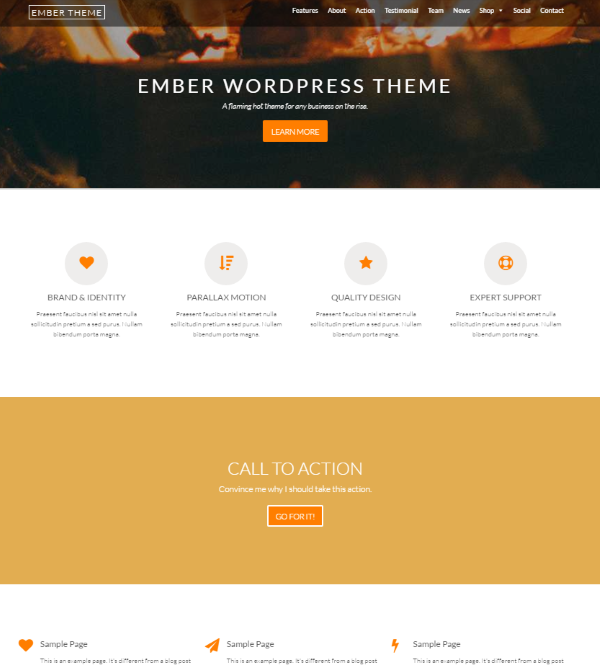 Ember is a one-page theme with parallax that can be expanded into an online store using WooCommerce. The sections are tied to the menu structure which even includes a max mega menu. Sample pages and post types are included which will display, along with your latest blog post, on the main page within your sections. Shortcodes and customizable colors allow you to customize the theme to suit your needs. You can manage your SEO using the tools included within the theme. It’s a great choice to creative agencies and freelancers. 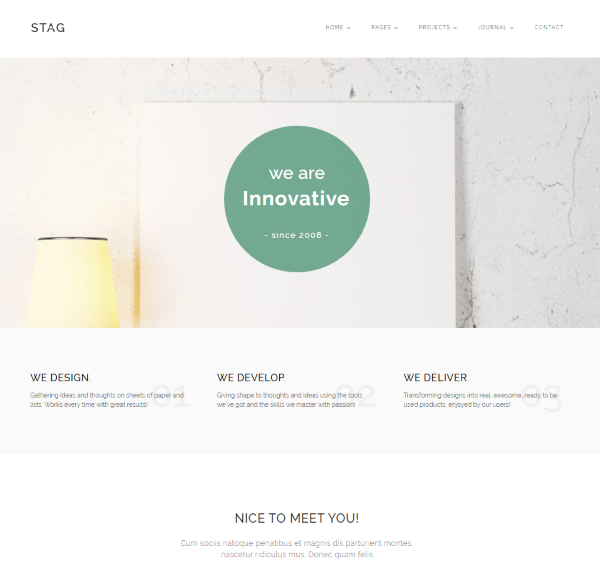 Stag is an interactive portfolio designed to showcase your work using SEO best practices with a focus on the user’s experience. It includes several theme demos and you can customize them even further using the drag and drop page builder. The theme options, parallax backgrounds, customizable header, and CSS animations add to the beauty of this theme. It’s a great choice for freelancers and creative agencies. 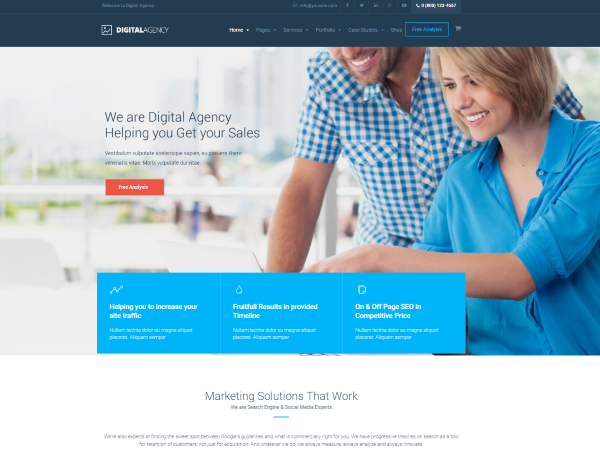 Digital Agency is an SEO optimized theme with page templates designed specifically for creative agencies. Showcase your work using a Case Study page that can display in 2, 3, or 4 columns. Talk about your services using the Services, About, and FAQ pages. Show off your work with one of the several portfolio pages which will display in 2, 3, or 4 columns. SEO optimization utilized the latest code trends and best practices for onsite optimization. This is a great choice for freelancers and creative agencies. My City was designed to showcase local events, communities, and directories. It has a strong focus on local SEO. A built in Google keyword planner helps you develop content specifically for your local area. The included stats can show you your SEO ranking factors so you know where to focus your social media efforts. Included widgets let you give special offers to your readers. It even includes the Uber Taxi service affiliate program. 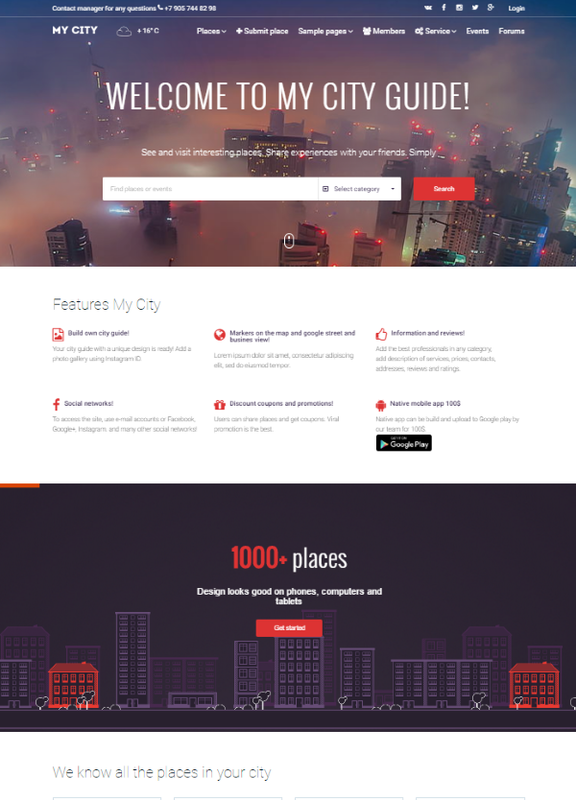 It’s an excellent theme for any website that focuses on local events or communities. SEO WP is an SEO-focus theme made in 2014 that was recently updated. It was created for SEO agencies and works to be the example of their SEO efforts. It includes premium SEO plugins to help improve SEO and page-loading. It includes sections for case studies, marketing free books and resources, a landing page template, forms, and more. It was named the best SEO WordPress theme for 2015 on ThemeForest. It’s a great choice for SEO and marketing agencies. 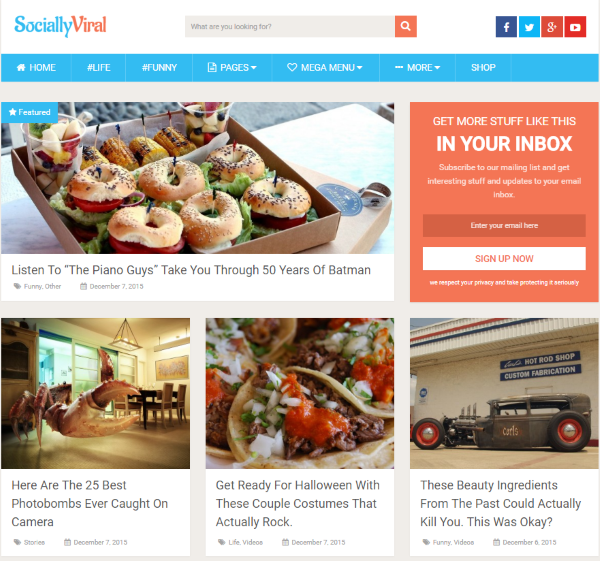 Socially Viral is a simple magazine theme designed to improve social sharing and boost viral traffic. It’s also designed to boost your search engine rankings. With a primary focus of improving traffic and social sharing, it has the social features you would expect such as sharing buttons, trending posts, social integration, featured posts, and more. It loads fast and even has schema integration so your website will rank higher in local searches. There are 2 different layouts built in and you can drag and drop single post elements. It’s a great choice for magazines and blogs of all types. MH Magazine is an older theme but it’s also a fast-loading theme designed to impress SEO experts. The code was written with the best SEO practices in mind. The theme is a widgetized template with multiple widget areas and comes with lots of custom widgets that you can place anywhere. 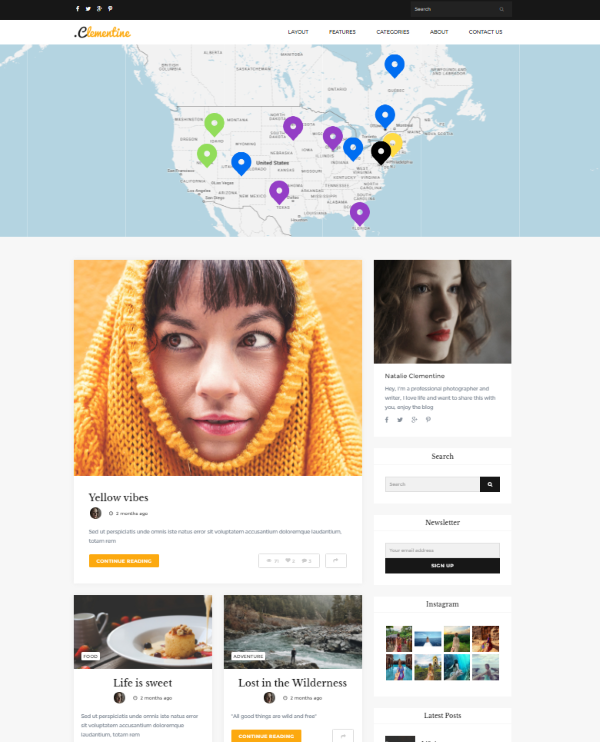 There are 12 demos of various layouts and color schemes to help you get started and show what can be done with the theme. It’s a great choice for any type of magazine, blog, or SEO-focused agencies. That’s 15 of the best SEO friendly WordPress themes for 2016 that make your content highly discoverable. As you can see, being SEO friendly is more than just being compatible with SEO plugins. These themes include clean code that follows best practices for SEO to tell search engines about your content. Between these 15 themes you’re sure to find what you need to rank high in search engine results and get your content discovered. Using Divi on one site at the moment and is great! My question is apart from Divi and Extra which I have yet to try, are there any other stand out themes I should try from my Elegant bundle? All of our themes are kept up to date. So you should feel free to try any theme that catches your fancy. That said, I’d recommend sticking with these two as they are the two themes we are putting most of our design/dev energy behind. Actually I found Divi to the best SEO friendly out of all you have on here. I’ve tried several others, but Divi run smoothly with Yoast and other SEO parameters. Curious Randy. how do you evaluate whether a theme’s SEO implementation is good or not? I have several checks that I perform and I’m interested in seeing if you do the same. Hi Quentin. I look at several points. One is SEO features within the options panel (ET’s themes have this). Another is the code for speed optimization, minification, and code types. I also look for features for schema, rich snippets, etc. I’m interested in hearing your evaluations (and thanks ahead of time for sharing). I like the design look of Divi but I’m not sure I would agree that it is the best for SEO. Unless I am mistaken it does not support schema or rich snippets. I use Divi on one of my sites. On another I wanted to use Extra which again I like the look of but it certainly did not support rich snippets and also had an issue with huge page sizes which is also great for SEO. One of the other themes mentioned in this round-up was Schema which is actually the theme I went with instead of Extra for this other project. Schema did not look as fancy as Extra but it still allowed me to create an attractive site and it really does work well for SEO. I’m a fan of Divi but let’s not pretend it’s the best theme for every scenario and there are certainly a few areas where Divi and Extra can be improved, SEO being one of them. There are lots of comments on forums also about how it does not always work well with Yoast but there are always other SEO plugins that others have success with. And i’m not sure if a theme with heavy plugins like visual composer for example can be good for SEO ? Or do you need very fast hosting solutions. In my experience theme coded with a proper semantic (schema protocol, for example) can have an impact on the ranking. They are many factors that will improve your SEO. Yes, speed is one of them, but in my opinion, it doesn’t matter if you site loads in 2 sec instead of 1 sec, as long as the other factors are there. For the mobile version of your site, it might matter a little more, but they are ways to make it load faster. Either way, I think that using Visual Composer help you to make a website that people want to browse, and consequently it might improve some other factors of your SEO. is AVADA not SEO friendly ? Hi Abdullah. It is. I was looking for extra SEO features, newer themes, and some that are not so well-known. Avada is a great theme. This is a great list. I am wondering which is the best SEO, and fastest loading for e-commerce? Thanks Bab. Most of the themes on this list would be great for eCommerce. Ember, Divi, and Extra are especially good (imo). Great collections, I like Schema and Stag, thanks man ? Actually, I really come to know that there are all the best SEO friendly themes out of all we have on web. Sure I will try one of these. This was one hell of a list. I use DIVI for my clients and it proved to drive in some really good results! Great list of awesome WordPress themes. Some of these templates are getting old for SEO, still a good list, except for DIVI which is the best template, can’t wait for 3.0. Thanks for sharing important news for seo friendly themes. I want to use one of them now for my website. Is there a seo friendly themes that free?? I’ve been seeing a massive growth in clients using divi over any other theme on the market including all those from themeforest – what’s the main reason for this? Great collection. Divi, Infinity and Qoon themes I like the most. How compatible is Divi with seo plug in such as pushbuttonseo and squirrly? Divi is really nice to handle with SEO plugings like Yoast. Its difficult to say which one is better. What say? I really love DeepFocus and ePhoto theme. Is it possible that someday, those theme would powered by Divi? Have worked with several themes that make SEO difficult so I will give the themes on this list a close look. Very useful post and interesting collection of info. Thanks for sharing. Great collection of superb WordPress themes. The list of the best SEO friendly WordPress themes is without doubt excellent one. If we wan your website or blog rank well in Google, then it is vital for your website or blog have an SEO friendly WordPress theme. Divi is a great theme, used it many times now and works well with Yoast for SEO.